This Belleek ornament is retired and limited to stock on hand. This Belleek Christmas ornament is crafted of fine china as a miniature bell design of Lismore Castle. 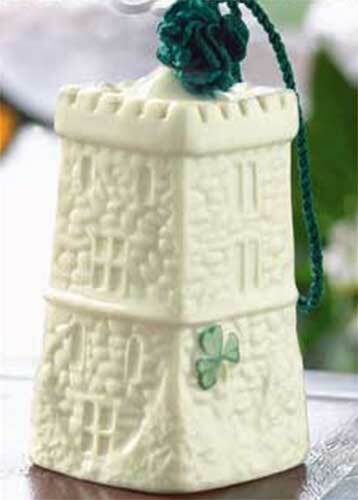 The Belleek Lismore Castle ornament is a functional china bell that measures 3 3/4" tall; it is complete with embossed detailing. The Belleek China ornament is enhanced with hand-painted green shamrocks and it is ready to hang on your Christmas tree with the Included green cord.